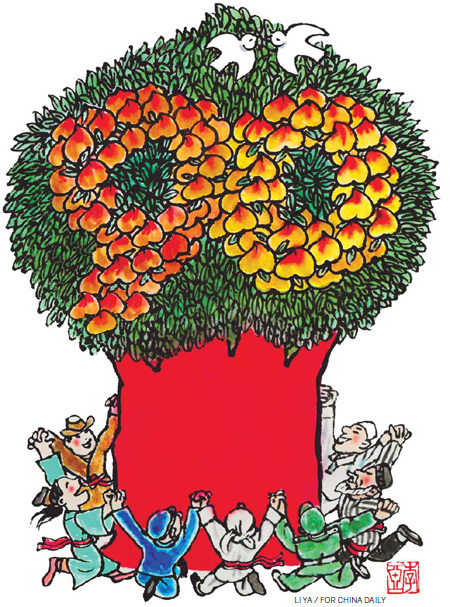 The position and attitude of the Communist Party of China (CPC) vis-a-vis reform, development and stability have made it successful in leading the country. China's reform started in the economic field. After the widespread economic and social development, political reform followed. Step 1: GDP of 1990 to be double that of 1980. Step 2: GDP of 2000 to be four times that of 1980, with people leading fairly comfortable lives. Step 3: By 2049, the 100th anniversary of the People's Republic of China, the country's development level is expected to be on par with mid-ranking developed countries. New step 1: GDP of 2010 to be double that of 2000 with people enjoying more comfortable lives and society becoming a relatively complete socialist market economic system. New step 2: By 2021, the 100th anniversary of the CPC, the national economy will be more developed and a better social system will be established. New step 3: By 2049, China will realize the modernization of society and become a prosperous, democratic and advanced socialist country. This approach of breaking down bigger objectives into several smaller goals is in line with the current needs of the people and gives them a better idea about the future. Two stages of development - a "well-off society" and "moderately developed country" - will link traditional Chinese ideals with modern international standards, which will be recognized and accepted by the people. Deng said two conditions are required to achieve the goals of the two stages of development: One is to make efforts to maintain a peaceful international environment and the other is to preserve political stability and unity at home. Stability is a prerequisite for reform and development. The "cultural revolution" (1966-1976) made the CPC and the people realize that if social and political stability and unity are lost, it will be impossible to achieve democracy and economic development, and chaos will follow. Deng repeatedly said it is in China's best interest to keep the country stable. For Deng and other CPC leaders, stability means political stability as well as policy stability. Political stability is crucial for China to achieve the desired objectives of reform. And policy stability is guarantee to political stability. So China should maintain its current policies both on the domestic and international fronts. On Feb 25, 1989, George H. W. Bush, then US president, paid a 40-hour working visit to China. During a conversation with Bush on Feb 26, Deng said that for China, stability would always be the top priority. Without a stable environment, nothing can be done and even economic gains will be lost. Deng said China must have a stable political environment to ensure the success of the reform. In October 1989, Deng met former US president Richard Nixon and reiterated that China has a large population and a relatively weak economy. If there is no political and social stability, and unity, nothing can be accomplished. Stability overrides everything else. Over time, the CPC has come to realize even more that reform is the driving force, development the purpose and stability the precondition. The three elements must be organically integrated. "We should always handle carefully the relationship among reform, development and stability," said Jiang Zemin, former general secretary of the CPC Central Committee, at a conference in 1998 to commemorate the 20th anniversary of the Third Plenum of the 11th Central Committee of the CPC that signaled the reform and opening-up. "Development is of overriding importance and China should rely on herself to develop. Reform is the driver of development and an unavoidable path to China's moderation. Stability is our overriding task. If there is no stability, then nothing can be achieved, and what achievements we have made will be lost." The author is a scholar with the Party School of the CPC Central Committee. The article is an excerpt from a book Why and How the CPC works in China, edited by Xie Chuntao, the deputy dean of the Party School's Party History Research Center.